On April 21, 2015, Facebook announced another update to their News Feed algorithm. For Facebook users and page admins, this update means two different things. For users, Facebook will try even harder to show you a good mix of relevant and trending content from your friends, family, and the brand pages you follow. They’ll show you more posts they assume you don’t want to miss and fewer updates about which stories your friends have liked and commented on. For page admins, Facebook’s trying to make their news feed content more relevant to each user. This means everyone will see a different mix of content based on their liking habits and declared interests. The effects of this update will vary from page to page. To help combat Facebook’s latest algorithm update, here are four tips you can start implementing today. This is one practice I’ve been preaching like crazy lately. Facebook likes it a lot when you post your videos natively. How much? Natively uploaded videos get 52 times more views than links to YouTube on Facebook, according to a blog post from GetResponse. If you normally get 2,000 views on your videos, make one small change to the way you upload your video and boom—you could get 3,040 views. The exact opposite of uploading your videos natively is copying and pasting a video link over from YouTube, Vimeo, or another video platform into your Facebook status update and sharing it that way. You’ve seen these types of video posts before. They look actually look different than natively uploaded video posts. They function differently, too. Natively uploaded video posts have one huge advantage over copied-and-pasted videos: they autoplay in the news feed. You’re scrolling through the news feed, some movement starts to happen, and just like that, you’re drawn into video content. Without having to do any reading or clicking, your attention has been captured. This is one big reason natively uploaded videos trump all other types of shared content on Facebook, for now. There are two major reasons you should check everything (links to blog posts, your ads’ landing page, an eBook download page, etc.) on your mobile device before you share it on Facebook. Reason #1: Mobile usage is high among Facebook users. Quarter after quarter, year after year, Facebook’s mobile usage continues to rise. Of Facebook’s 1.44 billion monthly active users, a whopping 40 percent of them use the social network on mobile devices only. Mobile DAUs were 798 million on average for March 2015, an increase of 31% year-over-year. You’re missing a grand opportunity if you’re not thinking about your users’ mobile experiences when you share content on Facebook. Reason #2: Facebook’s news feed algorithm detects the quality of the links you share. Facebook’s news feed algorithm knows the quality of your links. How? If a person clicks on a link you shared and spends time consuming the content they’ve linked to, it suggests to Facebook that what you shared is valuable, a.k.a. “high quality.” If, however, they click your link and come right back to Facebook, Facebook notes that that person didn’t find something they wanted or expected. And because Facebook only wants to show the best stuff in the news feed, they’re going to rank high-quality links above links that direct to high-bounce pages. Now let’s consider mobile. We know now that Facebook mobile usage is through the roof. If you want to be serious about making Facebook work for you, you need to think about mobile users. Why? What happens on mobile affects your content’s desktop rankings. If the content you share looks bad (or just plain doesn’t function well) on mobile devices, users will bounce quickly after clicking, and your content’s chances of making it to the news feed will drop. If you’re in the habit of checking on what other Facebook brand pages are doing and sharing, you’ll notice that the pages with posts that get great reach and engagement are the ones sharing content they specifically made for their Facebook audience. This is smart. One brand that gets this is the beauty and skincare company Clinique. Not too long ago, I listened to an episode of Jay Baer’s Social Pros podcast with special guest Shannon Otto, the North America social media community manager for Clinique. Otto mentioned that Clinique tries really hard to craft content that looks organic to the channel they plan to share it on. Instead of cross posting the same image they share on Facebook to all their other social networks, they make unique images to suit each platform. Here’s an example of this practice. Below are two images Clinique created to promote the same message on two separate social channels: Facebook and Instagram. As you can see, their Facebook image has some text overlay. This is the type of image Clinique would never share on Instagram. Why? Because it would stand out—in a bad way. Clinique’s core audience logs into Facebook, Instagram, and every other social network for different reasons, seeking different things. They also have different audiences on each platform. Can you relate? Their Facebook audience, which is primarily made up of savvy shoppers who might not necessarily be the most brand loyal, logs in to find deals and promotions. But on Instagram, those same users—along with the others who exclusively follow them on Instagram—log in to discover pretty and inspiring visual content. Knowing this, Clinique adapts their content strategy to the mood and primary function of each social channel they’re on. Again, this is smart. Far too often, brands will share a blog post, video, or image once… and that’s it. When you do this, your content essentially lives one life, and then it dies. Don’t let this happen to your content! Reposting your content on Facebook multiple times gives your content a longer, better life. Some people might question this practice , or think you can only pull off reposting the same content multiple times on Twitter. Here’s why you should not side with those people. On Facebook, a very tiny percentage of your fans see the posts you share. This has a lot to do with time zones and, of course, the fact that the news feed is more competitive than it’s ever been. For a long time, everyone quoted Facebook’s “16%” stat which stated, “The average post from a brand page only reaches 16% of fans.” That statistic was originally released in 2012, meaning it’s out of date and doesn’t consider all the news feed algorithm changes that have happened in the last few years. We can assume the average post reach percentage is even lower now. To give your content a better chance of being seen by a larger percentage of your fans, post your content multiple times. Facebook will continue to make changes to their news feed algorithm. Yes, it can make things tough for marketers, but how you adapt is what counts the most. 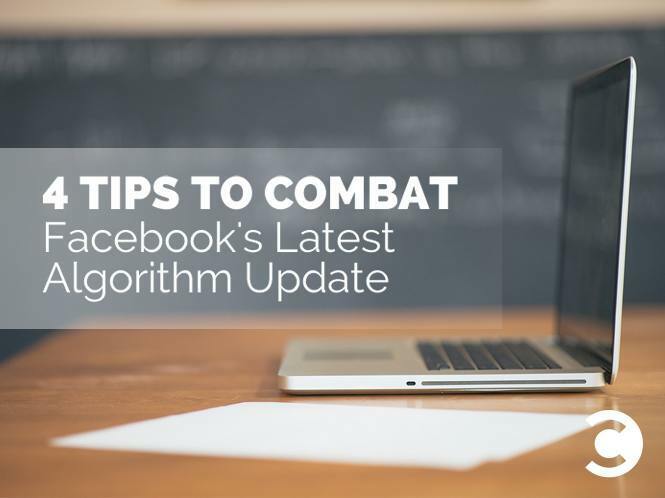 Has Facebook’s latest algorithm update affected your page? If so, what are you doing to stay agile on the platform? A version of this post was originally shared on Medium. Chelsea Hejny works as a content creator at ShortStack, an online tool you can use (for free) to build your business's social media marketing campaigns and landing pages.